Congratulations CVS Health! Today the largest integrated pharmacy company in the United States announced that it is now providing talking, braille and large print prescription labels through its mail service company (Caremark) to blind and visually impaired members. [Jump to Press Release below] Caremark is offering the accessible labels through Envision America’s ScripAbility system. Members can order the new labels by calling their Caremark call center number. Caremark’s general Customer Care toll-free number is 1-800-552-8159. Envision America can be reached at 800-890-1180. In developing its accessible prescription label program CVS Health engaged in Structured Negotiations with the American Council of the Blind and several blind Caremark members. The Law Office of Lainey Feingold and Linda Dardarian of the Oakland civil rights firm of Goldstein, Borgen, Dardarian & Ho worked on the initiative with the Claimants and CVS Health. Woonsocket, Rhode Island (January 5, 2015) – CVS Health (NYSE: CVS) announced today that it now offers the ScripAbility prescription accessibility system through its mail service pharmacy to CVS/caremark members who are blind or visually impaired. The system includes ScripTalk talking prescription labels as well as braille and large print labels. In March of this year, the company announced that ScripTalk talking labels were available from CVS/pharmacy for prescriptions ordered for home delivery through its online pharmacy, CVS.com. Today’s announcement further expands CVS Health’s offerings to its blind and visually impaired customers and members. The ScripTalk talking labels provide a safe and convenient way to access information on prescription labels for individuals who cannot read standard print. The ScripTalk labels are free to CVS/caremark members who are blind or visually impaired. Members can also obtain a free ScripTalk reader from Envision America that will enable them to listen to the information on the ScripTalk label. Members can request a product from the ScripAbility suite by contacting Caremark’s call center. CVS Health is dedicated to helping people on their path to better health as the largest integrated pharmacy company in the United States. Through the Company’s 7,800 retail pharmacies, more than 900 walk-in medical clinics, a leading pharmacy benefit manager serving approximately 65 million plan members, and expanding specialty pharmacy services, the Company enables people, businesses and communities to manage health in more affordable, effective ways. This unique integrated model increases access to quality care, delivers better health outcomes and lowers overall health care costs. Find more information about CVS Health at http://info.cvshealth.com/. The American Council of the Blind is a national consumer-based advocacy organization working on behalf of blind and visually impaired Americans throughout the country with members organized through seventy state and special interest affiliates. ACB is dedicated to improving the quality of life, equality of opportunity and independence of all people who have visual impairments. Its members and affiliated organizations have a long history of commitment to the advancement of policies and programs which will enhance independence for people who are blind and visually impaired. More information about ACB can be found by visiting www.acb.org. Please visit the Talking Prescription Category on this website to read summaries (with links) of all posts on LFLegal about this important health and safety issue. With today’s announcement, Caremark joins cvs.com mail order, Walgreens and Walmart in the growing list of companies that have worked with the blind community in Structured Negotiations on accessible prescription labels. Envision America maintains a list of all pharmacies participating in the ScripTalk program. 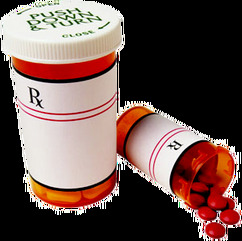 Read the ScripTalk Pharmacy list on Envision America’s website. In addition to ScripTalk by Envision America, a Talking Prescription Label solution known as the Digital Audio Label is offered by AccessaMed.